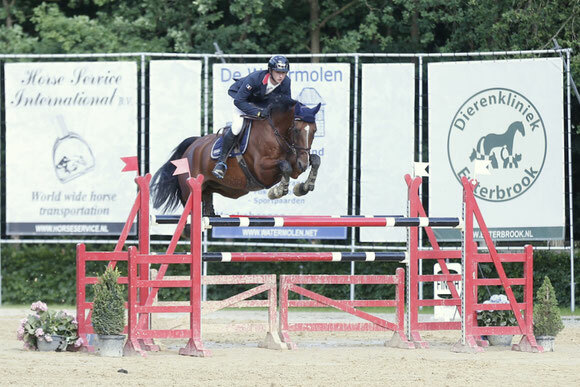 The France riders are very strong at the Dutch Youngster Festival. This evening Thibault Lacrevaz won the Roelofsen Horse Trucks Grand Prix for Young Riders at 1.45m level with Tom d'Ruffosse (Oncle Pol). Only 7 out of 51 competitors jumped clear in this Grand Prix and came back for the jump-off. Runner-up was Neal Vanderwegen (BEL) with Isidor J.H.Z., followed by Emilie Paillot (SUI) with Caja (Cornet Obolensky). Best Dutch rider was Kars Bonhof on place 6 with Zentos (Zento).